Battle Acre Park is a 1-acre site dedicated in 1839 to commemorate those who fought in the Battle of North Point on September 12, 1814. Regiments of the Maryland militia engaged in battles with the British Army at the same time Fort McHenry was defending the Baltimore Harbor from the the British Navy. The success of the Maryland militia forced the British to withdraw from the Chesapeake Region for the remainder of the War of 1812. 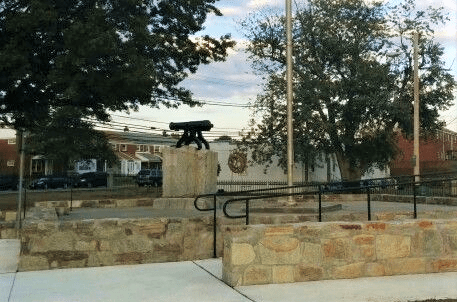 On September 14,1914, one hundred years after the battle, the National Star Spangled Banner Commission erected a monument topped with a memorial cannon, honoring those who fought in the Battle of North Point. In 2014, 200 years after the battle, the park was completely restored and interpretive signage and a large colorful mural were added commemorating the battle.